One expects political upheaval in Italy. 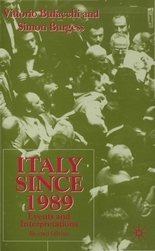 After all, the country has had as many governments as Boliva since World War Two, and my primer on Italian politics had a photo of parliamentarians fist-fighting on the cover. From the back cover, "Fisticuffs in the Italian Parliament"
But — Sweden? As Stephen Castle wrote in yesterday’s New York Times, Swedish politics are usually “worthy, high-minded and often utterly predictable, Swedish politics has rarely offered much by way of excitement” — pretty much the exact opposite of Italy’s opportunistic and treacherous circus, in other words. It’s certainly new to me — I’d have expected to hear more about the Netherlands, France or, if you want to look at the Scandinavians, Denmark — but inasmuch as it traces all the main themes common to the Italian debate — the future of the welfare state, the decline of industrial society, and rising immigration — I’ll be following it closely. This entry was posted in eu, immigration, italy, lega nord, the italian right, the right in europe and tagged bossi, Denmark, EU, far-right, france, immigration, italy, lega nord, Netherlands, New York Times, northern league, politics, sweden, United States, upheaval. Bookmark the permalink.